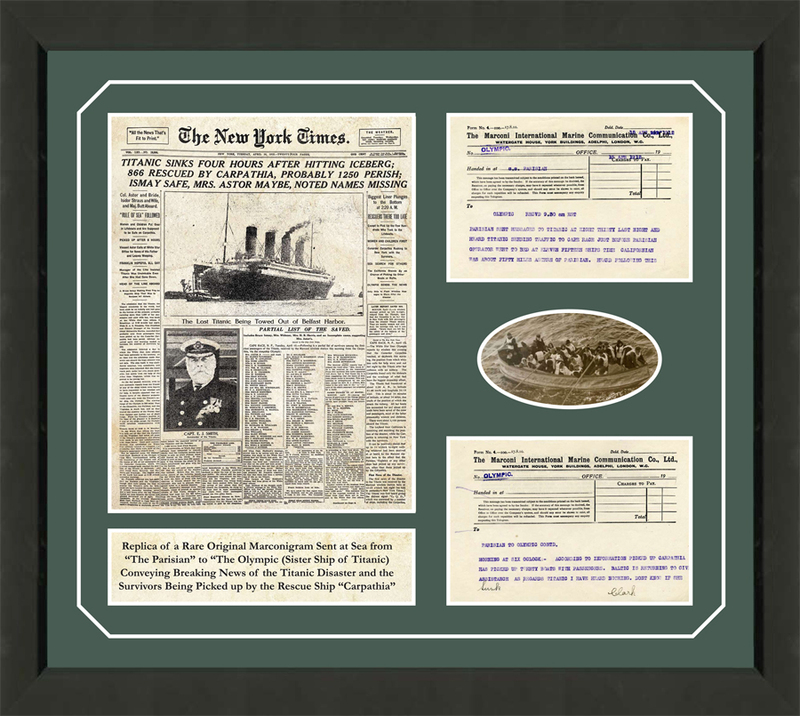 With the 100 year anniversary upon us, the RMS Titanic Universe Gift Shop carries some of the most sought after items you won’t find anywhere else on the web. Our selection of Titanic gifts is ideal for a collector as well as anyone who is captivated by the story of the RMS Titanic. 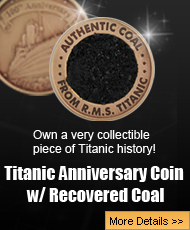 Contains authentic Coal recovered from the Titanic. Will immediately achieve “collector” status. 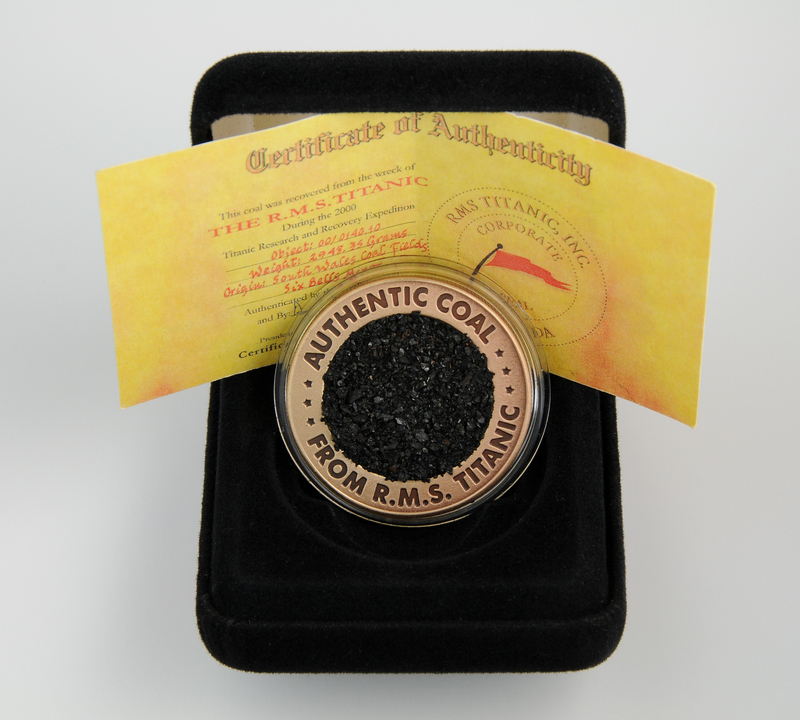 Each coin comes with a Coal “Certificate of Authenticity” from RMS Titanic, Inc. and its own registration number. More info and images of the Titanic Anniversary Coal Coin. 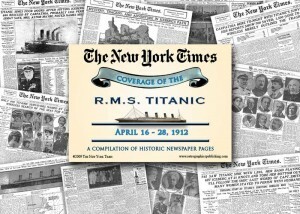 A re-printed collection of historic articles published in the New York Times in 1912 covering the RMS Titanic. More Info about NY Times Newspaper Articles. No international shipping available on this item. 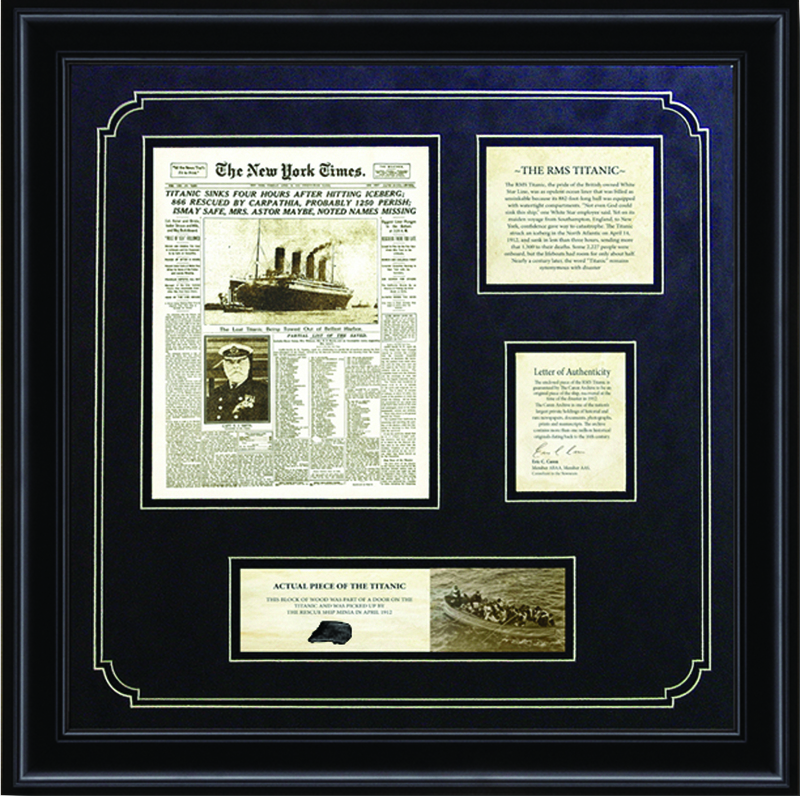 Includes an actual piece of coal from aboard the Titanic as well as a reprinted NY Times page covering the Titanic disaster. 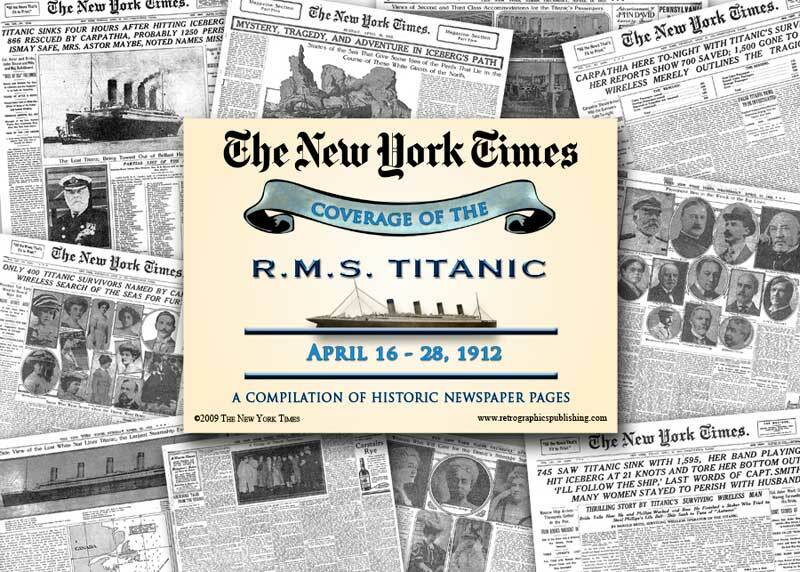 Includes a replica of a rare original wireless message sent at sea from The Parisan to The Olympic (sister ship of Titanic) as well as a reprinted NY Times page covering the Titanic tragedy. Titanic gifts are the perfect way to remember the historical significance of the Titanic. Now that the 100 Year Anniversary is upon us, it’s a perfect time to commemorate the disaster and celebrate life. 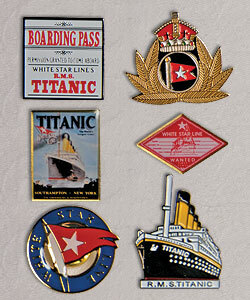 At the Titanic Universe gift shop, we offer the very finest in Titanic collector’s items as well as handsome novelty items on sale. A modern marvel of her time, the Titanic was the largest passenger ship when it sent sail in 1912 and met its ghastly and famous demise. Striking an iceberg in the middle of the Atlantic ocean, the Titanic sinking took the lives of 1,517 individuals. Many titanic gifts have been created in memory of those lost at sea as well as the technological ingenuity that was involved with the creation of the Titanic. With a wide variety of Titanic gifts in all shapes and sizes which you can buy for friends, family and loved ones, everyone in the family can learn about the rich history of the Titanic. Many museums or other establishments that commemorate the Titanic have shops that offer replica pens, boarding passes, newspaper headlines, and many other Titanic gifts that help enhance the historical experience. From stuffed animals to replica Heart of the Ocean gems from the Titanic Movie, Titanic gifts are fun for all ages. 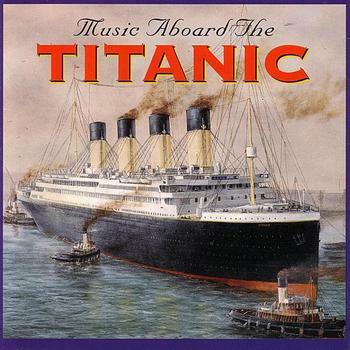 Some sites even have the option of personalized Titanic gifts for someone special on your list.